live for now, because tomorrow may be too late! Sadie cringes when Lane walks into the sanatorium cafeteria – at summer camp years ago, he invited her to the big dance, then dumped her flat. Read the first few chapters here for free to meet Lane and Sadie and the other teens who are hoping for a miracle cure during their time at Latham. The author of this just-published novel studied medical ethics, and her solid foundation of knowledge makes this fictitious strain of TB unnervingly realistic. Would you submit to an experimental medical procedure to save your life? 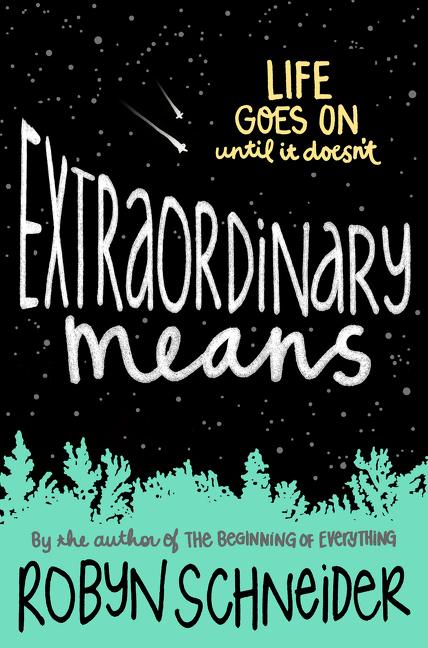 Book info: Extraordinary Means / Robyn Schneider. Katherine Tegen Books, 2015. [author site] [publisher site] [book trailer] Review copy and cover image courtesy of the publisher. My book talk:When a life-threatening illness pulls Lane out of his overachiever lifestyle, the high school senior can’t imagine that rule-breaking and a now-lovely acquaintance from summer camp could make what’s left of his life so much worth living. Diagnosed with drug-resistant tuberculosis and sent away for a rest cure, Lane frets about AP classes left behind instead of relaxing to slow down his disease’s progress. Finding Sadie from junior high camp days helps him try for some memorable moments in his life instead of his planned rush to get ahead. Sadie has been at Latham longer than anyone, has watched other teens with super-TB go out the gate either well or dead, and is sure that falling in love here is a terrible idea. She certainly didn’t count on Lane or his adorable eyes or his willingness to join her group of rule-breakers like wisecracking Nick and musical Charlie. Planning for college or getting a driver’s license – how does it make sense when they may never leave Latham? Rumors of a cure for their TB show up on the news regularly – what if the researchers really find one? ← Scarlett Undercover, by Jennifer Latham (book review) – teen investigating suicide & King Solomon’s legacy?